We can offer a wide range, from the lightest, touch-sensitive cut-resistant glove for the knife hand to the heavy-duty cut-resistant glove for the protection of the hand holding the product to be cut. 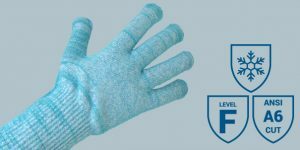 Our cut-resistant gloves can be machine-washed at high temperatures and have been specially developed and cetrified for use in the foodstuffs industry. 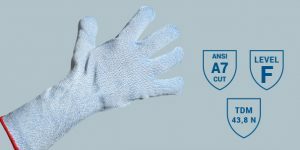 All Cutguard® cut-resistant gloves are available in a range of sizes, identified by the same Euronorm colour-code as stab-resistant gloves. Our Cutguard® bluetouch offers unequalled touch-sensitivity and at the same time highest-level cut-resistance especially for the knife-holding hand. 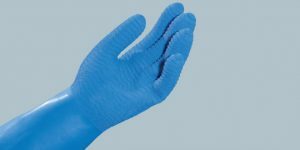 Our cut-resistant gloves Cutguard® bluetouch have colour-coded hems in accordance with the Euronorm for chainmesh gloves to simplify your ordering. Our Cutguard® knight for the knife-holding hand provides superlative touch-sensitivity in combination with top-level cut resistance. Der Cutguard® Cut-resistant glove with maximum cut-resistance, improved quality and fit. Our cut-resistant gloves Cutguard® have colour-coded hems in accordance with the Euronorm for chainmesh gloves to simplify your ordering. Our Cutguard® blue cut-resistant glove with stainless steel core for even more effective protection and improved durability. Our cut-resistant gloves Cutguard® have colour-coded hems in accordance with the Euronorm for metal mesh gloves to simplify your ordering. Our extra-stength Cutguard® monster cut-resistant glove with stiness steel core for improved protection and durability. 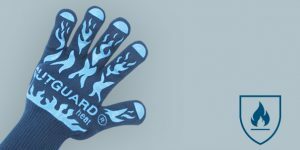 Our Cutguard® thermo is the cut-resistant glove for low temperature and highest safety requirements. Our cut-resistant glove for extreme heat protection. Our derinding glove gives the wearer a secure grip in damp conditions and ensures safe handling of slippery objects.